Storage case holds over 40 knives of various sizes. 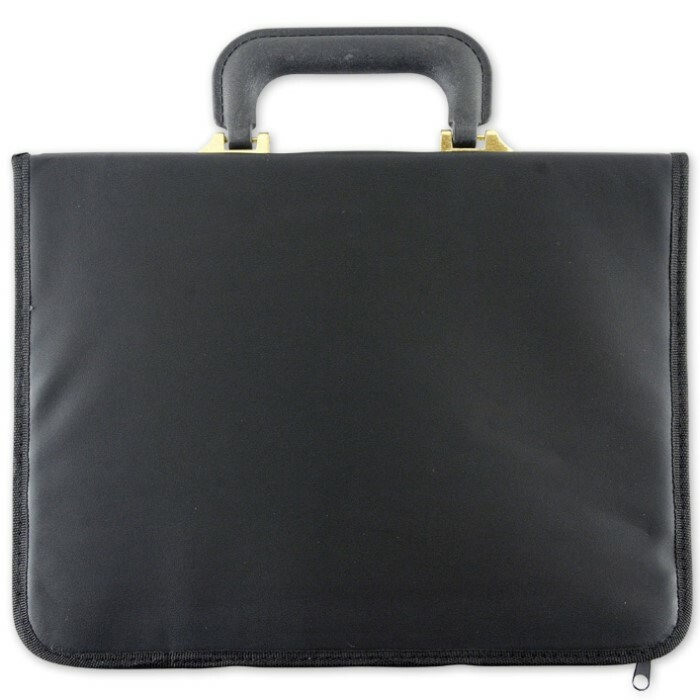 Features comfortable swing handle and a rugged imitation leather exterior. Red felt-lined interior with elastic straps and zipper closure (knives not included). Size: 14" x 10-1/2" x 1-3/8" closed, empty. I was very excited to have a nice knife case, especially a fancy looking one. However, I was sad to see a good majority of my knives - all bought from Budk - either didn't fit or was a very, very tight squeeze. It was so tight in fact I worried I would break the straps just trying to get knives right beside each other. Thus far the only product I am disappointed with. None of the knives I bought from bk work well it this case. The elastic straps are to close together and not large enough to hold anything but a small traditional pocket knife with one blade. I got my knives in but does not look than great and can only hold about 15 knives. This is one of the best items for storing knives. It's compact and sleek. It looks nice and doesn't cause suspicion when, for say, lying around in a bedroom. This is what every knife collection needs. A good way to keep all your knives organized, also a good way to show your friends or buyers. 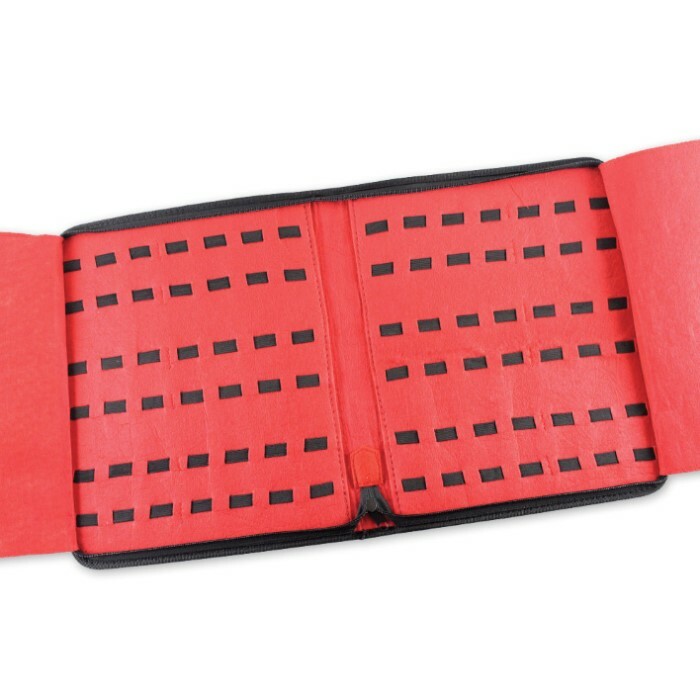 This will be my forth knife case and my collection is growing fast, elastic holds perfectly well, good zipper, storage, materials, easy to use holds up nicely. Took over a week to get here and this one is different from the picture but over all excellent storage case no problems at all, so glad to have this. This case will fit any knives depending what size and budk is a great company to do business with, I'm happy with my purchase, will always buy from again. This is what every knife collector needs. 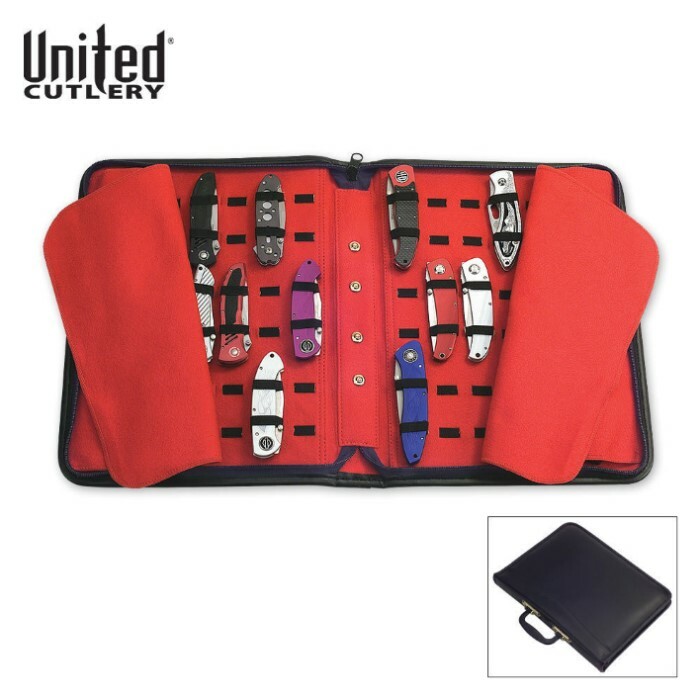 This case helps you to keep all of your collectibles in order and transport them with ease.I really hope that they create one for the larger knives! Excellent item. Good quality with a good zipper. Highly recommend for knife storage. Good product. Holds up well and doesn't rip when stretched. I have three of these now... two are full and I am working on the third. They are absolutely wonderful to carry and show your knives to others, whether to friends or to buyers. Easy to load and unload knives, fantastic protection for your beauties and makes storage a snap!